Her name is much more recognised across the world today than that of the effective ruler of the country or any of his military or executive aides – She is Fayza Abul-Naga, Egypt's Minister of International Cooperation. Western, especially, American officials and diplomats simply hate her – and so does the Western media. They say she is a stumbling block in the face of the advancement of Egyptian Western relations. 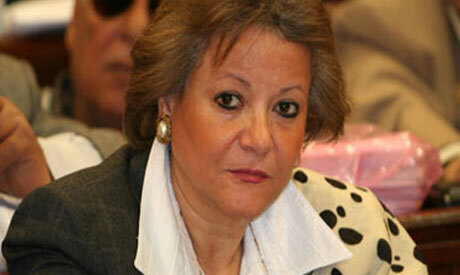 Some of them call her "a lady of the past, with a disturbed obsession over 'Egypt's sovereignty'". Foreign diplomats in Egypt have described her as "the strong woman" of the Egyptian cabinet – some even say "the strong woman of Egypt" – and even "the shadow prime minister" or "the right arm of the Field Marshal" Hussein Tantawi, the head of the ruling Supreme Council for Armed Forces (SCAF). Initially, anger against Abul-Naga was triggered by her attempt to block the Egyptian negotiations with the IMF to get a grant of over $3 billion in a quest to solicit donations from the Western coffers to help Egypt during the transitional phase. Members of Egyptian civil society despise her, and say she is a tool of the ousted Mubarak regime to attack and wreak vengeance against the very civil society organisations, especially rights groups, which have played such a significant part in bringing down the Mubarak regime in the revolution of 25 January. Some go as far as calling her "the Suzanne Mubarak of the Field Marshal" in a reference to the speculated negative influence that the former First Lady exercised over her ousted husband. They blame her for the recent attack on several American, European and Egyptian non-governmental organisations (NGOs) and are sworn to drive her out of the office – no matter how much confidence she has from Tantawi. None of the above, argue those who worked with the originally career diplomat who took her first ministerial post in 2002 as Minister of State for Foreign Affairs before she was appointed Minister of International Cooperation in 2004, the job that the close to 60 year old lady is keeping, firmly. "Abul-Naga was never my cup of tea; I never thought she was as brilliant as some people took her to be but I always thought that she was very committed to serve the nation's best interests – to the best she knew and the best she could," said an Egyptian diplomat who worked under Abul-Naga when she was Egypt's Permanent Representative in Genevain the late 1990s. Abul-Naga, the daughter of well-off Port Said family and the graduate of the school of commerce with a PhD in development, is best known as a disciples of former minister of state for foreign affairs Boutros-Boutros Ghali – the man who gave so much attention to Egypt's relations with Africa. When Ghali went on to be elected as to the post of UN Secretary General in the early 1990s, Abul-Naga, a favourite aide who has a good command of Arabic, French and English, was selected among his immediate support team. When she came back to Egypt, she was handpicked by then foreign minister Amr Moussa , who always described her as "an astonishing diplomat", to head the African desk at the foreign ministry at a time when Mubarak was cool in relation to Africa following the failed attempt on his life in Addis Ababa in the early 1995. At the time every single African diplomat in Cairo was complaining about the Egyptian disinterest in Africa. The name of Abul-Naga was always referred to as an exception to the rule. Indeed, it was Abul-Naga's distinctive role in managing Egypt's African relations that made her first introduction into the nation's upper corridors of power. In Algeria in 1997, Abul-Naga was introduced to former president Hosni Mubarak by Moussa to assist in the sessions of a tense African summit. The ousted president recognised the skills of the strong woman. It was this introduction that gave Abul-Naga the attention and even the support of Mubarak when she fought tooth and nail against Youssef Ghali, the then supremely influential minister of Finance, to block his plans to get Egypt to agree to international commitments, under the World Trade Organisation, that would have sky-rocketed the prices of pharmaceuticals in Egypt. Abul-Naga was summoned from Geneva, the headquarters of WTO, to make her case. She won a major victory and had her name listed in Mubarak's agenda to be assigned minister of state for foreign affairs, only a few years later, whereby she became a cabinet colleague of Ghali's. Those who worked with Abul-Naga during her early years as minister of international planning have endless stories to tell about how she used to give Ghali and his team a very tough time during the cabinet meetings. According to some of those aides it is this firm political posture, along with her ability to keep good but not too close ties with Mubarak and the First Lady, that had impressed Tantawi and made her a close confidante of his during Egypt post-revolutionary turbulent transition. "(Tantawi) says she is a patriotic and smart lady and he trusts her judgment, clearly," said one former advisor at the prime minister's office. Today, informed sources say that Tantawi's support to Abul-Naga – actually his confidence in her – has not wavered. Beyond the rule of Tantawi, which should expire on 1 July, it is unlikely that Abul-Naga would have much of a political future. Abul-Naga is aware that she is perceived by many as a remnant of the Mubarak regime – not just because she was one of his serving ministers but also because she was a member of the ruling National Democratic Party (NDP), which Mubarak presided over, and who won herself a seat in the flagrantly rigged parliamentary elections of 2010. Those who know Abul-Naga well say that she knows that her days in office in the Egyptian government are numbered anyway and that she would not mind being remembered as the lady whose last job was to give the Americans a hard time – well-deserved, as she insists.